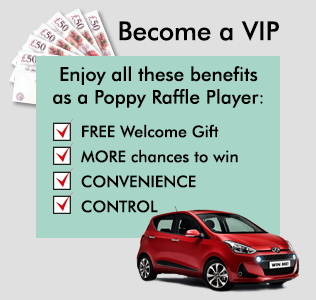 Subscribing to the Royal British Legion's quarterly raffle draws and becoming a VIP Poppy Raffle Player is easy. You can enter online here. Simply choose the number of entries you would like in each raffle, enter your personal details and that's it! There are 4 raffle draws each year. We’ll send you an email confirmation and a letter in the post confirming your subscription, including your raffle ticket numbers. Your payments will be collected quarterly in the first week of August, November, February and May. We will publish a list of winning numbers and post a cheque straight to you if you are one of our lucky winners. 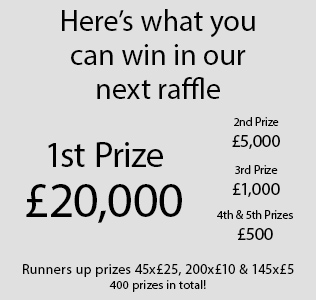 As a VIP player, for each raffle you also have the chance to win an extra £500. 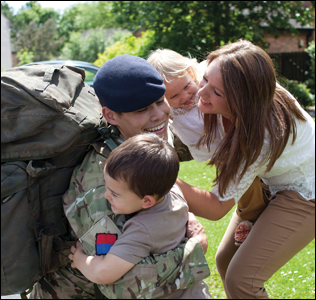 If you have any questions please contact the Raffle office on 0800 954 0256 or supportercare@britishlegion.org.uk (Monday - Friday, 9am - 5pm) and we will be happy to help you. You can cancel your subscription at any time by instructing your bank or by contacting the Raffle office. Please see the raffle terms and conditions for more details. Entrants must be 18 or older and due to licensing requirements, resident in Great Britain (England, Scotland or Wales).